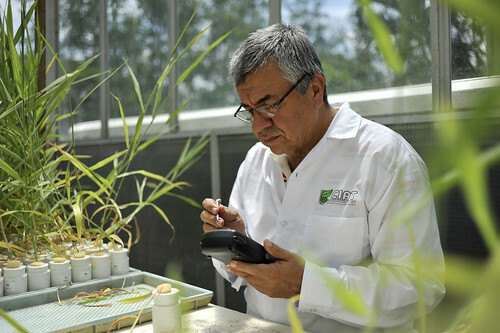 Guillermo Sotelo of CIAT’s entomology team, working with brachiaria grass in a greenhouse at the institution’s headquarters in Colombia (picture credit: CIAT/Neil Palmer). ‘. . . On 13 September, researchers announced that they have bred a tropical pasture grass that can significantly suppress greenhouse-gas emissions. The team, from the International Center for Tropical Agriculture (CIAT) in Cali, Colombia, is working with Dow AgroSciences, based in Indianapolis, Indiana, to get seeds onto the market in the next 3–5 years. . . .
‘The solution, says Michael Peters, an agronomist at CIAT and leader of the team that has developed the low-emissions grass, is to encourage ammonium to persist in the soil for longer, by suppressing microbial activity. . . .
‘In the 1980s, CIAT researchers noticed that some grasses grow well even without fertilizer — particularly Brachiaria humidicola, which is adapted to low-nitrogen South American savannahs. After years of hunting, they identified a nitrification inhibitor secreted by the grass’s roots. Called brachialactone, it reduces nitrous oxide emissions by blocking enzymatic pathways in nitrifying bacteria. That leaves more nitrogen available to help the plant to build tissues. ‘. . . The researchers have spent more than 8 years breeding the plants to maximize this ability. Peters says that they have doubled the release of nitrification inhibitors, and are now checking that this has not decreased the overall productivity of the grass. As a side-benefit, the team reported this week at the 22nd International Grasslands Congress in Sydney, Australia, brachialactone seems to persist in the soil: maize (corn) grown in pastures that previously hosted Brachiaria produces nearly four times as much grain with low levels of fertilizer as maize grown in previously cropped land. . . . . This research forms part of a larger initiative referred to as LivestockPlus, which proposes to deliver major benefits for the poor and the environment through innovative research on tropical forage grasses and legumes. The LivestockPlus initiative takes place within the global framework of the CGIAR Research Program on Livestock and Fish, led by the Kenya-based International Livestock Research Institute (ILRI). The program aims to increase the availability and affordability of meat, milk and fish for poor consumers and raise the incomes of smallholders producing these commodities. Tags: Brachiaria, CIAT, grass, Greenhouse gas emissions, IGC2013, Michael Peters, Nature (journal). Bookmark the permalink.